Four organizations serving Wetzel County were awarded grants totaling $6,000 from the Wetzel County Fund, a component fund of the Community Foundation for the Ohio Valley. The announcement was made during a presentation held at the Wetzel County Chamber of Commerce to recognize grant recipients. The Wetzel County Fund serves as a tool to help county residents, businesses and organizations realize the benefits of charitable giving in their community. Since its inception, the fund has received support from the Wetzel County Commission, EQT and numerous individual donors. Any business, organization or individual may give a gift to the Wetzel County Fund at any time. 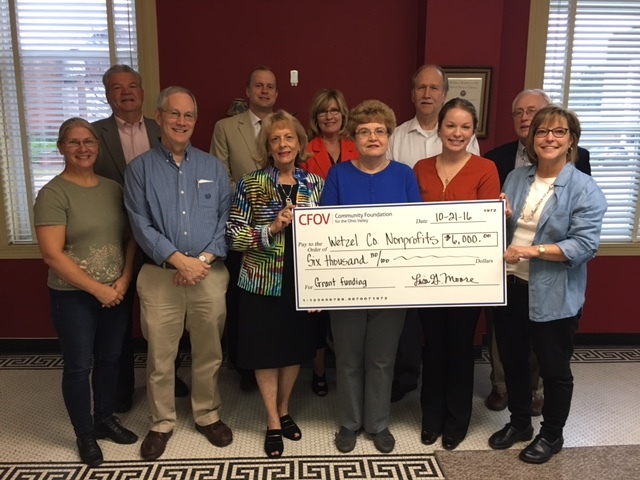 Contributions help to sustain this long-term giving tool, which is administered by the Community Foundation for the Ohio Valley and supported by an advisory committee comprised of Wetzel County community leaders. Christine Mitchell is a member of the advisory committee and is pleased to see such worthy projects receive support. “The Wetzel County Fund is a great way for our nonprofits to continue improving services and opportunities in our community. I’m proud to be part of this endeavor and look forward to the future of this fund,” Mitchell said. In all, thirteen organizations submitted proposals and four were selected to receive funds to support projects related to child welfare and advocacy, public safety and school-based programming. Youth Services System received funds to support prevention, intervention and treatment programming supplies used in eight Wetzel County schools. Jill Eddy, director of community based services at YSS, is grateful for the additional financial support. “These grant dollars will be used to help us further increase access to important mental health and substance abuse services in Wetzel County. Our office and staff in Paden City allows us to be present in the community and identify at-risk students and connect them with a wide variety of services to address individual needs,” Eddy shared. Future funding opportunities from the Wetzel County Fund will be announced as they are scheduled. More information about the Wetzel County Fund and other CFOV grant programs can be found by visiting www.cfov.org/grants.